Students learn about DNA fingerprinting in a dry lab setting. This kit introduces students of biotechnology, forensic science, or AP Biology to the concepts of DNA replication and how it relates to PCR (Polymerase Chain Reaction) and RFLP (Restriction Fragment Length Polymorphism) analysis of DNA. Students observe how DNA analysis can also be used to diagnose disease. This activity is a great introduction to or review of DNA fingerprinting. 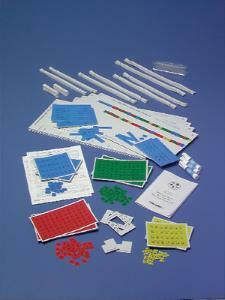 Ordering information: This kit includes a teacher’s guide; student worksheets and guides; nucleotides sheet: cytosine 28 (blue); nucleotides sheet: guanine 28 (yellow); nucleotides sheet: adenine 66 (red); nucleotides sheet: thymine 66 (green); DNA stands, labels, sheets; mutant CFTR; normal CFTR; primer 1; primer 2; template-mutant CFTR; template-normal CFTR; electrophoresis bands, labels, sheets; mutant cftr pcr product (22 bp); mutant CFTR RFLP product (10 bp); mutant CFTR RFLP product (14 bp); normal CFTR PCR product (25 bp); normal CFTR RFLP product (25 bp); adhesive strips sized for 4 bp, 30 18 bp, 30 21 bp; adhesive strips sized for 22 bp, 3 25 bp; DNA polymerase; glue sticks, removable; bags, re-sealable; taql restriction enzyme; and work boards, two-sided.